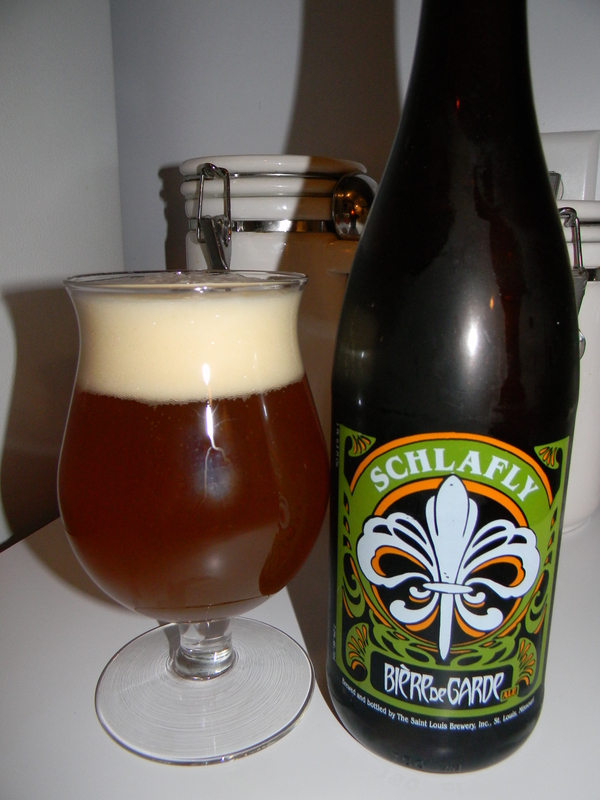 Review of Schlafly Bière de Garde | Beer Apprentice - Craft Beer News, Reviews, Interviews and Info. Hello again everyone. It’s time for another craft beer review. This time I’m going to be trying the Schlafly Bière de Garde produced by the St. Louis Brewing Company located in St. Louis, Missouri. I’ve been pretty fortunate to be able to get a lot of stuff from Schlafly in my area and I’ve tried most of them, yet I’ve never tried this one, so I’m pretty excited about it. Let’s get to the website, schlafly.com, and see if they have some sort of description of the Bière de Garde. Our Bière de Garde invokes the tradition of the farmhouse ales of Northern France, renowned for their subtle aromas of apricot and allspice. Four different types of malt create a toffee sweetness, while French Strisselspalt hops add a subtle spice flavor. The beer is fermented with a distinct French farmhouse ale strain, then bottle conditioned with extra sugar and yeast for at least two weeks. Nice. Let’s get to it. This beer came in a 25.4 oz. bottle with an ABV of 7.0%. It poured a hazy deep orange to almost amber type color. The head was eggshell white and sized very well. The texture was soft, fluffy, kind of soapy and semi-rocky. The retention time was good and the lacing looked decent enough. Not a bad appearance I didn’t think. The bouquet was chocked full of fresh grass and grain tones. A touch of sweet caramel along with a minute biscuit fragrance too. A light fruitiness of orange citrus intermingled with some yeast and some mellow peppery spice as the brew opened up and began to relax. The taste didn’t seem as complex as the aroma in my opinion. The peppery spice did become more prominent and the grassiness was still there, but the orange citrus and the earthy/yeasty characteristics were a tad bit muted. A little bit of funkiness made itself known though, which I liked. The mouthfeel was medium bodied. Mostly smooth, dry and even a tad chewy. A nice, medium strength carbonation seemed about right for the style and I even got the slightest inkling of warmth from the alcohol. A solid dose of flavor was left behind on the palate for me to enjoy between sips. Overall, I thought this was a pretty nice beer. For sure one to try if you can snag a bottle. I didn’t think that any one attribute was “world class”, however all were sturdy, stable and sound. The drinkability was good and I definitely wouldn’t mind trying it again sometime. I think the Schlafly Bière de Garde is part of their “Bottle Conditioned series and I believe it’s available year round, so keep an eye out for it. If you’ve tried this beer feel free to leave a comment and tell me about your experience. Did you like it? Would you drink it again? Thanks for reading everyone. I really appreciate the support.